Chris Cuzme of Fifth Hammer Brewing Company makes their signature brews at a newly opened Long Island City facility. Chris Cuzme is marrying his two passions in life. By day, he is the owner and head brewer at Fifth Hammer Brewing Company, but by night, he entertains beer drinkers with his saxophone. 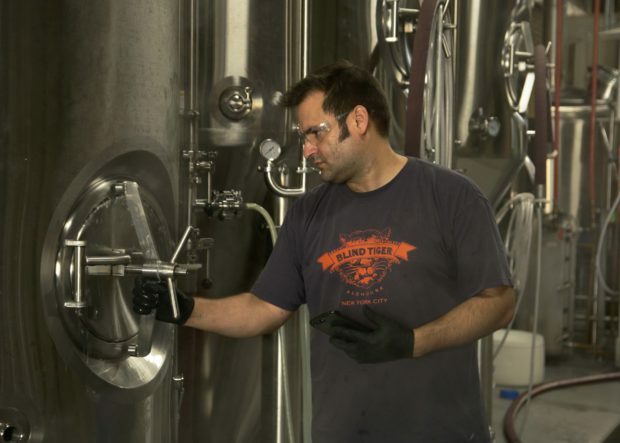 After 10 years working in the beer industry for breweries and creating marketing campaigns, he’s now taken the plunge into owning a brewery. It is the fifth brewery and taproom to open in Long Island City, but he sees that as a benefit not competition. Cuzme said beer drinkers already come to the area, so he can test new types of brews. One thing that will benefit the brewing company is the expansive 2,000-square foot taproom. “It is one of the largest taprooms in Long Island City,” DiStefano said. Cuzme anticipates the taproom to be their main source of revenue. Cuzme was concerned of losing customers because of the price and size of beer offered. The nearest taproom, Rockaway Brewing Company, serves half pints for $3, pints for $6 and a tasting flight for $7. Fifth Hammer Brewing Company offers small size glasses, including 4 oz. and 14 oz. at the same price and their flight of beer costs 70% more at $12. There are some new wholesale orders, but Cuzme is still figuring out how to make bigger profits so he can play his music. “It’s all about how I can make money and still play my saxophone,” he said.